Dr. K's Healthy Breakfast Ideas to Help Start the School Day Off Right! The word says it all: BREAKFAST means this is the first meal of the day after a night of fasting. Special attention should be paid to this important meal, which many of our kids overlook as unimportant. Some argue the lack of time as the excuse to skip breakfast. Others mention the hectic morning routine, with other chores to attend to, or the early hour they must get up in order to get to school in time. Those who have made a habit of eating something in the morning don’t necessarily choose the right food to ensure a provision of energy for the early hours of the day. Most of our breakfast foods are loaded with empty calories and simple carbohydrates. We’re given a false sense of satiety, but that fades a couple of hours later because the body quickly absorbs the nutrients, leaving us with emptiness in the middle of the morning, when we most need the energy to get through to lunch. Here is what happens after a high carbohydrate meal: The body takes in the carbohydrates and stimulates the production of Insulin by the pancreas. Our blood sugar shoots up rapidly, and plummets just as fast, encouraged by the hormone Insulin. The initial feeling of being full is short lived, and we’re left with low energy the rest of the morning. So how do we solve this problem? It all starts with a more balanced meal, providing some carbohydrates, but also a fair amount of protein and fiber to slow down the absorption of nutrients. Some examples of protein would be eggs, meats, cheese and milk. They are also easily accessible and fast to prepare. 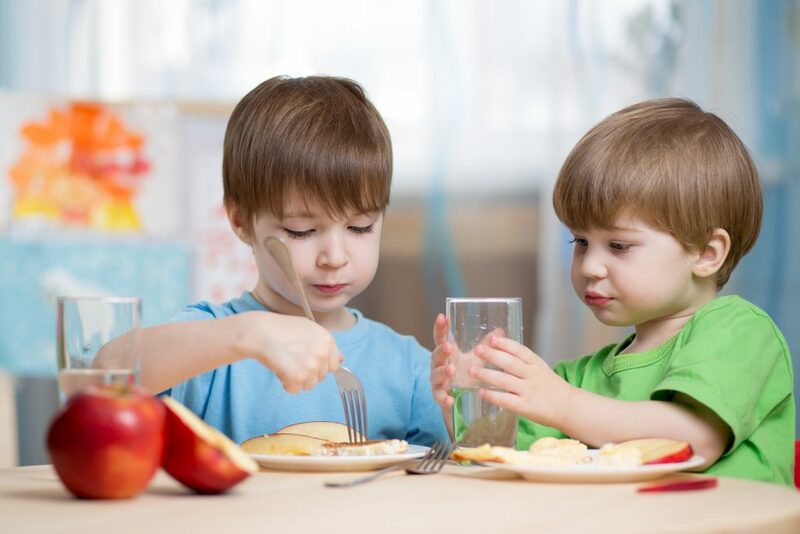 The balance provided by the combination of protein and carbohydrates, together with the slowing-down effect of fiber, provides a meal that will last through the morning, giving our kids the mental alertness they need to get their schoolwork done. Examples of breakfast foods that are fast and nutritious: These menus are easy to prepare and can be rotated throughout the week to encourage good eating habits. Get rid of the processed food in your pantry and opt for healthier choices. When aiming for good nutrition, improvisation is the number one enemy. Have all the ingredients ready at the beginning of the week and enjoy a good breakfast and a good morning. Depending on the age and size of the child he/she may be able to eat all the items on the breakfast examples or just part of them. The important thing is that the breakfast is balanced to provide the best start for a day of learning.